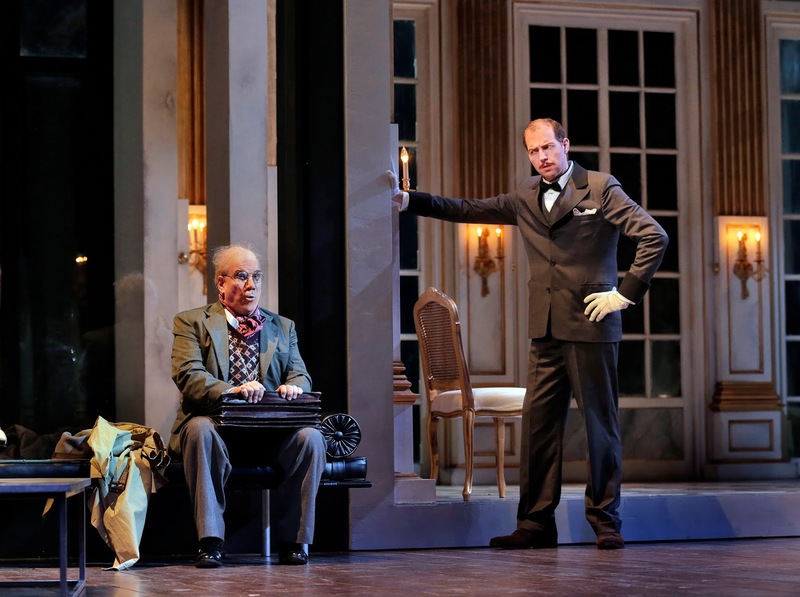 For our final opera this year at Santa Fe Opera, on 5 August 2016, we caught Tim Albery's production of Richard Strauss's Capriccio designed by Tobias Hoheisel, a production which travels to Garsington next year. Amanda Majeski was Countess Madeleine, Susan Graham was Clairon, Craig Verm was the Count, Ben Bliss was Flamand, Joshua Hopkins was Olivier, David Govertsen was La Roche, Allan Glassman was Monsieur Taupe, Shelley Jackson and Galeano Salas were the Italian Singers, and Adrian Smith was the Major Domo. Leo Hussain conducted. Hoheisel's spectacular set consisted of a modernist, Mies van der Rohe-style house with the panelling from an 18th century room at its centre, like a collected object. The rear wall was glazed and looked out onto a terrace with the views across the hills West of the Santa Fe Opera House. The weather denied us the spectacular sunset for which the set seemed to have been designed, but was striking nonetheless. Costumes were loosely 1940's with Amanda Majeski wearing a pair of extremely striking outfits. The opera was sung in German, with the usual subtitles in the seat-back in front of you, but Tim Albery had clearly been concerned to bring out the meanings in this most text heavy of operas. The performance was highly gestural, with each performer bringing a vivid sense to their dialogue, though it has to be admitted that the German occasionally sounded a bit effortful. This very visual style seemed to encourage the audience to laugh; Albery had not directed it as a comedy as such, but the production style rather invited this. The problem for me was that the audience laughed at the jokes in the subtitles rather than at what the singers were saying, and I longed for the opera to be done in English. 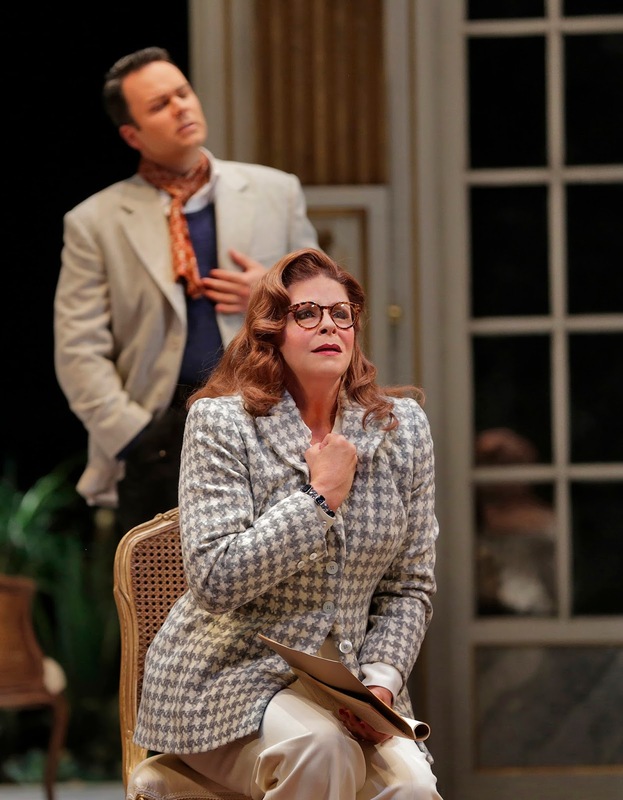 The cast were almost exclusively native English speakers, as was the majority of the audience and when Santa Fe Opera gave the USA premiere of the work in 1958 it performed it in English. Frankly, I feel that this is what they should have done this time. 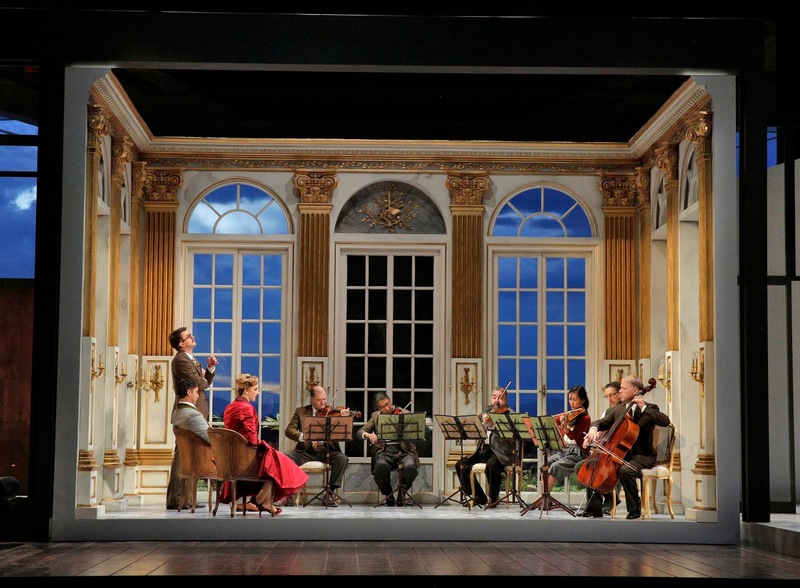 In the second half of the opera, when the members of the house-party all gang up on La Roche for his rather over the top ideas for the theatrical event for the Countess's birthday, the gestural language rather pushed the piece into physical comedy. 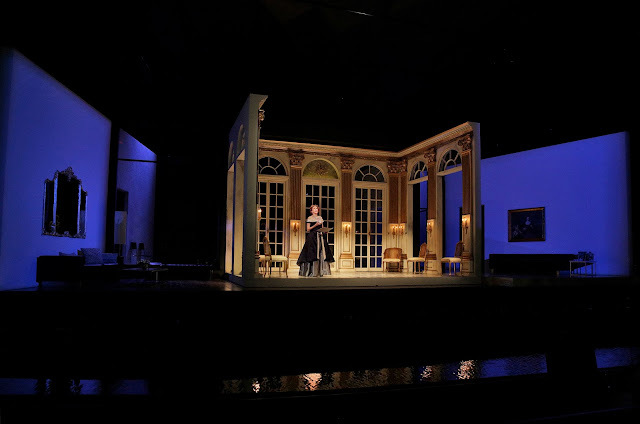 So that instead of being a witty dialogue about what theatre and opera really are, it became a comic set-piece which obscured the work's message. Capriccio is a work which treats a serious subject in a relatively light way, and getting the balance right is tricky, especially with a cast all of whom are having to work hard on the vast quantity of German dialogue. Amanda Majeski looked stunning as the Countess, tall and elegant she wore her costumes well and epitomised the witty intelligence of the part. You really could imagine this Countess having long, intense and sometimes funny discussions about the nature of art. She has a bright, quite high-tension voice with a striking, tight vibrato. She was perfectly at home in Strauss's conversational style, and though she could perhaps have brought a bit more light an shade to it, there was an naturalism to her delivery which worked well. In the great final solo though, I would have liked her voice to relax a bit more. The long lines sounded a bit too high-tension and I was aware of the complexities of the vocal writing, in a way which should not happen, and there was something of a sharp edge to her delivery. But at the very end, when she sang the final lines quietly we had the sort of beautiful relaxed tone which I had wanted earlier. I am aware that not everyone felt like this, talking with other audience members over breakfast the next morning, I was certainly in a minority and most found Majeski spectacular in the role. Susan Graham, looking the epitome of modern style in a trousers, brought a combination of warmth of timbre and sharpness of wit to Clairon. Her Clairon had claws, but she coated her barbs with beauty of tone in a delightful way. Graham is a highly watchable singer, and she had the knack of being effortlessly in character when not singing and when reacting to other people. The younger members of the cast did not quite match her, but it was clear that a lot of work had gone into making the piece. Craig Verm looked charming as the Count, singing with a rugged bluffness but the role seemed to lie a bit high for him and passages were more effortful than they should be. 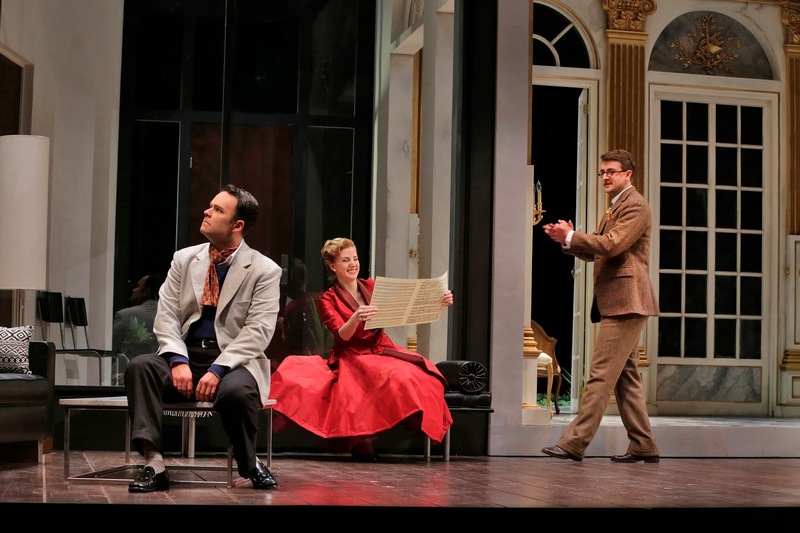 Ben Bliss and Joshua Hopkins made a wonderful double act as Flamand and Olivier, both clearly singing off the text in a highly vivid way and giving nicely delineated portraits. Both strongly infatuated with the Countess, yet each different and when Ben Bliss's Flamand complained that Joshua Hopkins' Olivier had 'composed me' the moment was sheer magic. Hopkins even managed to convince when Albery required him to half conduct, half emote during the opening sextet. David Govertsen was a nicely bluff La Roche, complete with a sense of his own importance which brought off the moments when La Roche announces that neither Olivier nor Flamand would be anything without his work as a director. His presentation of the plans for the Countess's birthday was wonderfully funny even if, as I said, the whole scene was really a bit too much. Shelley Jackson and Galeano Salas made a nice turn as the Italian singers, sending up the performance style and then making great effects in the consuming of cake and port whilst the house party argued. Monsieur Taupe is a gift of role, and Allan Glassman gave a masterclass in his delightful short scene. Adrian Smith was the epitome of poise as the Major-Domo and of course, he got the last line of the opera 'Supper is served'. Leo Hussain encouraged the orchestra to bring out the lyrical beauty of the score, yet never overwhelming the singers so that the tone remained conversational. The opening sextet, played on-stage of course, started things off in fine style. During the lovely intermezzo at the end, the horn playing was magical and throughout this final scene the orchestra gave Strauss's elegiac writing (his final work for the operatic stage) a beautiful sheen. This was perhaps not quite a vintage performance, but it had the necessary wit, elegance and poise. Above all, the singers worked finely as an ensemble, creating a real sense of dialogue complemented by the lyrical beauty of the orchestral playing.